What exactly are the Maggy Awards? Think of them as readers’ choice awards. We started recognizing the Best of Western Wake in 2006, and the Maggys have grown tremendously every year. A two-part nomination and voting process kicked off in September. We asked readers to nominate their favorites. New this year, to streamline voting, the 10 nominees in each category with the most nominations made the final ballot. Thousands of people voted in October, and the entrants with the most votes are the winners. No. Winners are determined solely by reader votes. But several winners are advertisers in the magazine. True, some frequent advertisers are recurrent winners. Many businesses also choose to run “thank you” advertisements to show appreciation for our readers’ support. Why were some of my favorites not on the ballot this year, even though I nominated them? We know your time is precious. The Maggy Awards ballot has gotten substantially longer over the years as we have added categories and garnered more nominations. It’s daunting to face a list of 100 entries in a single category, so this year we limited the ballot to the businesses with the most nominations. Why were some previous winners not on the ballot? Year after year, you have encouraged us to feature more local businesses as Maggy Awards recipients. We recognize that local establishments likely don’t have the widespread recognition of national chains, so in order to honor your requests, we limited this year’s ballot to locally owned restaurants, shops and service providers. Why are there still some national chains? The ballot does include locally owned franchises of national brands. I disagree with one of the winners. I had a bad experience! No business is perfect. Even the best are bound to have off days and a few unsatisfied customers. Consider giving the winners another chance to redeem themselves. I missed the voting process this year. How can I find out about it for future years? 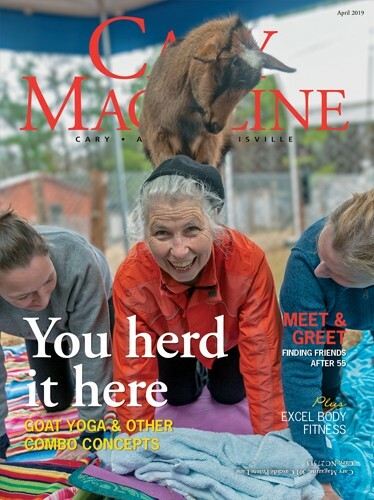 Subscribe to our email newsletter and follow Cary Magazine on social media. Here we announce when voting begins and send out reminders as time is winding down.